DSHG 1000 XRF Handheld Precious Metal Analyzer - Buy Handheld Precious Metal Analyzer, Genius 1000XRF , Precious Metal Analyzer Product on Dshing Instrument Co.,Ltd. 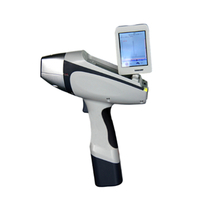 Genius 1000 XRF is designed for on-site composition identification, featuring small, light, precise, rapid, beautiful, safe, convenient, waterproof and long standby time. Equipped with digital multi-channel technology, it greatly improves the detection limit and stability of the instrument, expanding the application fields. This product has passed strict testing and inspection, and all index are accorded with the related technological requirements, reaching international advanced level. Precious metals here refer to the eight metal elements Au, Ag and Ru, Rh, Pd, Os, Ir, Pt in family. Most of these metals have beautiful colors. They are normally unreactive as they have strong resistance to chemicals. They are usually made into jewelries or souvenirs and have wide industrial application. DSHG 1000 XRF tests precious metal fineness for gold, silver, platinum, palladium, etc., in accordance with National Standard GB 11887 Jewelry-Fineness of Precious Metal Alloys and Designation and GB/T 18403 Precious Metals Jewelries Content Non-destructive Test Method X-ray Fluorescence Spectrometry. Small power integral end-window miniature X-ray tube, large dimension beryllium window electric-cooling SDD detector(the best detector in the world), and miniature digital signal multi-channel processor, greatly reduce the testing time and test deviation, and improve the detection precision, which make it have the similar performance as the desktop. 1-2secs for rapid detection, more than 10secs for precise detection, whose results are similar to the results gotten in lab; no destruction to sample. Instrument not only can operate fast detection with handheld type within 1-2 seconds, but also can operate longtime precise detection with desktop type, having the similar precision as the laboratory detection after 10 seconds. Helium-charging system (optional) greatly expands measurable range (analyze elements from Mg), satisfying the requirements of customers for light elements detection. It can directly analyze on the surface of the analytes, without needing of preparing samples. Built-in intensify calibration method ensures simple deviation calibration caused by different geometry shapes and inhomogeneous structure density. Observation of testing position at any time. It is equipped with professional alloy analysis software. Combining FP with EC software, it is easy for operation and acquiring wider application fields. Built-in system, HD touch screen (resolution 640*480), digital multi-channel technology, and SPI data transmission technology, effectively accelerate the data transmission and improve counting ability. Automatically shut-down of X-ray light tube within 2 seconds with no sample in testing; the radiation level is far lower than the international safety standard; compliment away test safety cover. Compliment away two Lithium batteries (7800mAh), it can continuously work for 8 hours all together. It is convenient for charging because of wide voltage AC charger and Onboard charger. Waterproof and dustproof function provide the ability of working under high temperature and humidity. Its body is manufactured with high strength military material, which is moistureproof, shockproof, and pressure resistant.